It's the end of an era for Future Publishing, which has decided to shut down PC Zone. 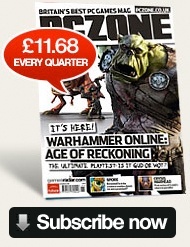 After 225 issues, Future Publishing's PC Zone magazine is shutting down. The publication, which launched in 1993 and was purchased by Future Publishing in 2004, is being shuttered by its parent company for vague reasons, citing a "strategic review" as the driving rationale. "Yes, it's true," the UK-based magazine revealed on its blog. Following a strategic review of Future's PC games portfolio, the company is now consulting the PC Zone team about the proposed closure of the magazine, with effect from issue 225 (on-sale 2nd September). "That's all we can say for now. But rest assured: If 225 does turn out to be PC Zone's final issue, we're going to break ourselves to make it a bloody brilliant finale to 17 years and 5 months of the best PC gaming magazine the world's ever seen." From PC Zone's phrasing, it sounds like there's a small chance the magazine might not get closed completely, but it also doesn't seem like anyone really expects this to happen. The magazine's closure marks the end of a long-running name for videogame journalism, which is always a little sad to hear about. While PC Zone may be closing, it seems that sister magazines Computer and Video Games and PC Gamer are still going strong, since no similar announcements have been made by Future.